The heavyweight division promises to become quite interesting indeed in the coming months. We have one world champion in Anthony Joshua taking what many are saying is his “most dangerous” fight (Wladimir Klitschko aside) – his mandatory defence against rough, tough and ultra-experienced former champion Alexander Povetkin on September 22. 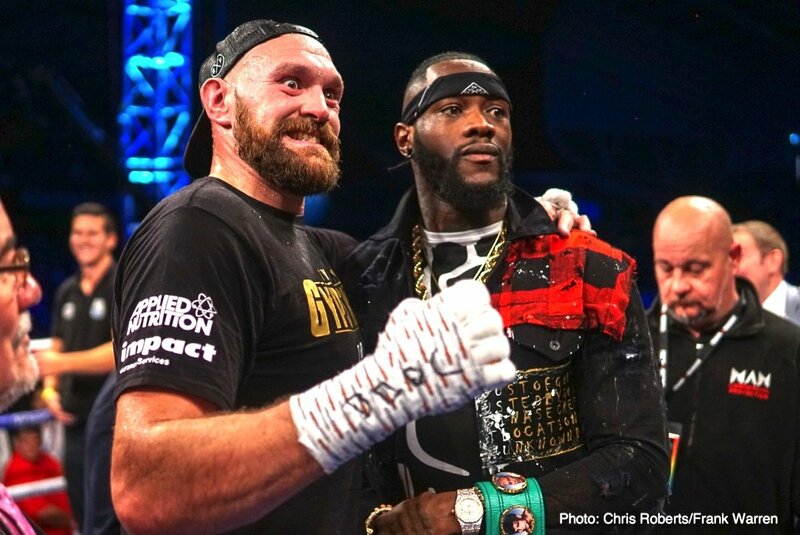 Then, we think (we hope) the other world ruler, Deontay Wilder, will face lineal champion Tyson Fury on an as yet unconfirmed date this year (likely to be Las Vegas in November or maybe December). Both Povetkin and Fury have their supporters, fans along with experts who feel they will pull off the big win and become champion all over again (Fury never losing his titles in the ring). Povetkin has, at the very least, a puncher’s chance against the admittedly still learning Joshua, while Fury, if he’s in the kind of physical condition he was in when he upset Klitschko to become king back in late 2015, has a great chance of outboxing the admittedly raw and crude Wilder. But Joshua and Wilder will take some beating. Joshua is looking to be in fantastic shape with less than two weeks to go, and he is promising to deliver a KO that will in large part make up for his dull but effective decision win over Joseph Parker in his last fight. Povetkin, though, has nothing to mose. He is almost 40, the Russian knows this is his last chance to rule again and he will almost certainly go for it. This fight could even come down to who lands a bomb first wins. Wilder we know will be coming for a KO win over Fury, the 40-0(39) Wilder always looks to tear off the head of his opponent. Fury has also predicted a KO but we can take that talk with a pinch of salt. Fury’s best chance, his only real chance, is to box, box, box, make Wilder miss and land with enough counters and jabs to pile up enough points to bag the win. It promises to be tough. A Povetkin KO over Joshua would be a shocker, no doubt, but perhaps not one that no-one saw coming. Povetkin can punch, he can fight on the inside and he is still fast even at age 39. And Joshua has looked vulnerable against punchers – both Klitschko and Dillian Whyte having him in trouble, Klitschko especially so. As such a Povetkin KO or stoppage cannot be written off at all. But Fury, wiht just those two “soft” comeback wins under his belt, has the tougher assignment. At some point Wilder is going to tag Fury. Can Fury take the power no-one else has managed to take (barring Bermane Stiverne in his first fight with Wilder)? Wilder supporters say no. A Fury win over Wilder would come as a bigger surprise than a Povetkin win over Joshua. Agree or disagree? You are here: Home / Boxing News / What Would Shock You More: Povetkin Beating Joshua Or Fury Beating Wilder?